28 January 2019 -- The World Baseball Softball Confederation (WBSC) today welcomed Australia and China as the 11th and 12th national teams that will compete in this year's WBSC U-18 Baseball World Cup® in Gijang, Republic of Korea. The dates for this prestigious youth baseball world championship -- a 10-day global tournament -- will run from Friday, 30 August to Sunday, 8 September. Australia's U-18 National Team was crowned the 2019 champions of Oceania yesterday (27 January), finishing ahead of second-place American Samoa, third-place Guam, fourth-place New Zealand and fifth-place Palau, becoming the 11th team to earn the right to compete For the Title of World Champion at the U-18 Baseball World Cup in Gijang. The WBSC also awarded a wild card to world No. 20 China -- currently the fourth-highest ranked baseball team in Asia -- to complete the 12-team field in Gijang, which also includes Canada, China, Chinese Taipei, Japan, Korea, Netherlands, Nicaragua, Panama, South Africa, Spain and USA. "Congratulations to Baseball Australia, the youth champions of Oceania, and congratulations to the Chinese Baseball Association for being awarded the wild card after demonstrating tremendous growth and promise for our sport in China," said WBSC President Riccardo Fraccari. "With the 12 teams now confirmed, these top finishers across the five Olympic continents will now move on to select their best youth baseball players to compete in one of the top youth world championships in sports." 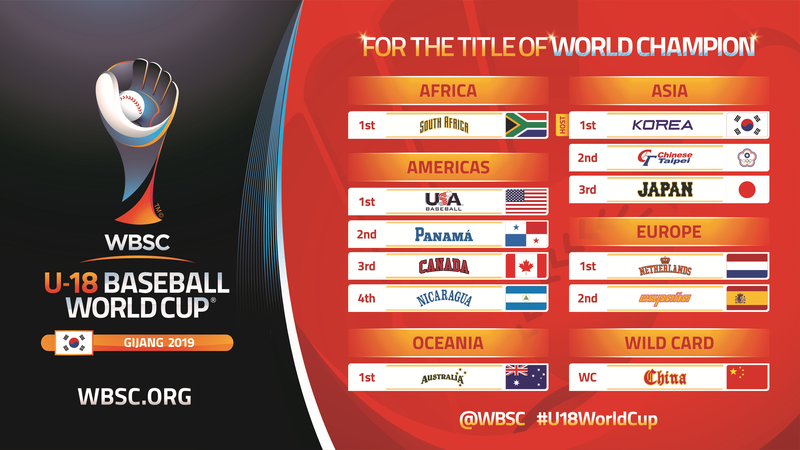 The official tournament website of the XXIV WBSC U-18 Baseball World Cup has been launched at https://u18bwc.wbsc.org/en/2019 and across six languages, including English, French, Japanese, Korean, Spanish and Traditional Chinese. Gijang-Hyundai Dream Ballpark, the largest baseball-theme park in Korea, will be the site of the XXIX WBSC U-18 Baseball World Cup. The Korea Baseball Softball Association (KBSA) will host one of WBSC's jewel events in collaboration with Gijang County and the nation's Ministry of Strategy and Finance, and Ministry of Culture, Sports and Tourism. The U-18 Baseball World Cups, along with its continental qualifiers, have consistently featured players who have gone on to become some of the biggest names in the sport, such as Japan's Yu Darvish and Shohei Ohtani; Korea's Shin-soo Choo; Cuba's Yasiel Puig and Aroldis Chapman; and Clayton Kershaw, Bryce Harper, Francisco Lindor, Manny Machado and Buster Posey, who all played for USA Baseball's U-18 National Team.